This reaction extent is limited by the equilibrium constant, taken to be 13.4. This Demonstration plots the residue curve passing through the locator. It also superimposes the bubble temperature distribution, which indicates that acetic acid is a stable node with the highest boiling temperature (shown in magenta). 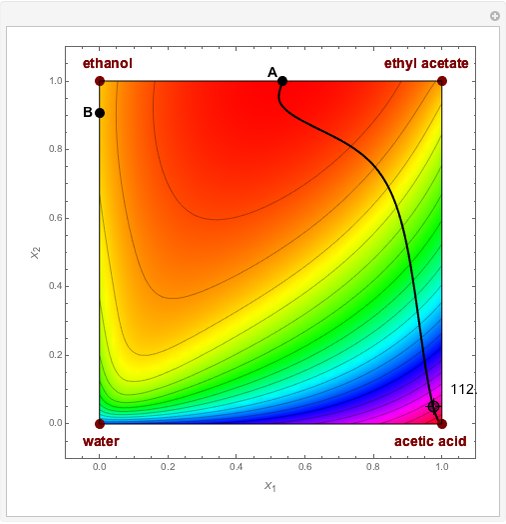 There are two nonreactive azeotropes in the system: (1) azeotrope between ethanol and ethyl acetate labeled A (an unstable node with a low boiling temperature show in orange); (2) azeotrope between water and ethanol labeled B (a saddle point with an intermediate boiling temperature). Finally, pure water and ethyl acetate are two saddle points and pure ethanol is a stable node. The Demonstration also displays the temperature, expressed in °C, at the locator's position and the iso-temperature curves. M. F. Doherty and M. F. Malone, Conceptual Design of Distillation Systems, New York: McGraw-Hill, 2001. Housam Binous, Ikbel El Glaoui, and Ahmed Bellagi "Residue Curve and Temperature Distribution for Ethyl Acetate Chemistry"